From the outset I should probably tell you that this is going to be a very different race review for Casual Runner. You see, this is the first race review I am writing for a race that I did NOT run. It still kind of stings, but I will get through it. 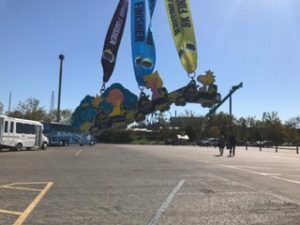 As you may recall from my earlier article, I had every intention of running the 2016 Run and Ride Kings Island Half Marathon, but a nasty flu bug in the days before the race scuttled my race plans. Instead, I ended up checking down to the Kings Island 10k, which is run concurrently with and on the same course as the half marathon. 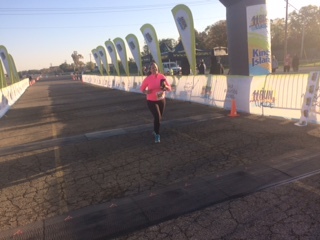 You can check out Candace’s full 10k race review now! But I REALLY wanted to run this race for a few reasons, and I would be remiss if I did not share them with you. First, it is a super-fun half marathon course. Run and Ride employs a double-loop course, which means that, not only will you run amongst Kings Island’s awesome roller coasters and backstage areas, but that the race director maximizes the amount of time you spend doing so. Second, the swag is great, but more on that in a moment. Third, this is a challenging course, without being overly-challenging. It is fun to have some of those courses in your race calendar. Fourth, it is a FUN race weekend. I think you are starting to get the idea. As you can tell, I am a fan. But just because I could not run this race, does not mean that I missed the opportunity to run half of the course during the 10k and to spectate the rest so I could share my thoughts with you all. So here we go! 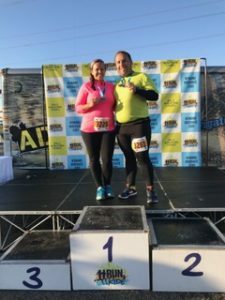 If you really want the full story of my lead-up to the race, go ahead and check out both my my earlier article and Candace’s full 10k race review, as pretty much nothing went according to plan for us, but I am sure you can all relate to that. There is no formal race expo for this event. There is a packet pickup throughout the weekend at Kings Island Amusement Park. What you should know is that, as a part of your Golden Runner Award-winning swag pack, your race entry includes Kings Island park tickets. So, if you are making a full weekend out of this race (which you should), you should plan on going earlier so you can grab your park tickets and maximize your roller coaster time before and after the race. You also get free parking at Kings Island on race day, a tech event T-shirt, a Buff (for your inner-Survivor fan! ), and discounted tickets for your non-running roller coaster enthusiasts. You may be starting to get the idea why we are such big fans of Run and Ride event weekends. As we mentioned, parking is free on race day. The only challenge was getting in to the Kings Island parking lots. The race starts and finishes in the parking lot in front of Soak City Water Park, which is at the south end of the parking lot. We tried going into the north entrance, which was closed. You have to use the south entrance, so just keep that in mind when you run this race next year. When we arrived at the pre-race area the DJ was already pumping the tunes and trying to get people going. 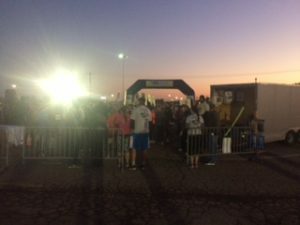 It was a cold fall morning in Southwest Ohio, so many runners chose to hang out in their cars. The best part about this setup was that the car parking was just steps from the starting line, so staying warm was very easy to do. We did not see any port-a-potties at the starting area, and were pleasantly surprised to hear that they opened up the (heated!) restrooms inside Soak City for us! Yes, it is the little things that excite Casual Runners on race day. The only problem with this was that I waited in a long line for the smaller restrooms at the front of the park, only to learn later that there were bigger facilities open just behind it. A little better direction would be appreciated in the future as this is a HUGE plus for this event. 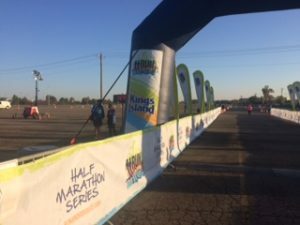 The half marathon and the 10k utilize pretty much the same course, with the half starting a few minutes before the 10k and then running the loop twice. The announcer did a great job of making sure runners were advised of this and were ready to run the correct event. So lets go to the race! The event utilizes a mass start, which, while I am not usually a fan of these, works for this event as the field size is manageable for the start and there is plenty of room to run. There are also pacers to help you set your rhythm. You can check out our Race Review from the 2015 event for more course details, but I want to hit on some highlights for you to help you understand why I appreciate this race the way that I do. Parking Lot: You hear “parking lot course” and immediately start questioning my sanity. But I have to tell you, while I am not a fan of running in parking lots, it works for this course. You will spend your first 2 miles or so in the parking lot getting your legs under you for the race. It also lets the crowd thin itself out nicely before the big highlights to come. Additionally, in the early morning hours, it actually makes for a nice run. More than anything else, there are two big payoffs of this format. First, it allows the race to double-up on a water station, as you will pass the same station twice during this section. This allows them to both minimize the number of volunteers needed and maximize on-course refueling. Second, the way the amusement park and its parking lot are situated, you get to see the roller coasters in the morning sunrise, just begging you to come run amongst them. For a roller coaster enthusiast, this is a fun experience. 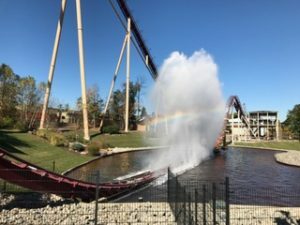 The Park: You enter the park via the main gates and immediately run along the avenue of water fountains towards Kings Island’s version of the Eiffel Tower. As you make a turn between the fountains and the Tower, there is another water station pulling double duty as you will pass this way again in another mile or so. Like I said, smart and efficient. My only criticism was that the lemon-lime Gatorade was mixed a bit too strong on race day, but that is an easy fix for future races. When I say you run through the park, I mean it. The race director earned his money by designing a course that maximizes the amount of time you spend IN the parks. This is a lesson more course designers should heed: give the runners what they want! I loved it. Loved it. Loved it. Loved it. There is just something about running through an empty amusement park as roller coasters are cycling through their morning tests that is invigorating, exciting, and fun. It almost makes you forget that you are running 13.1 miles. Almost! Backstage: Any theme park or amusement park geek knows that going to backstage areas is the holy grail of park touring. 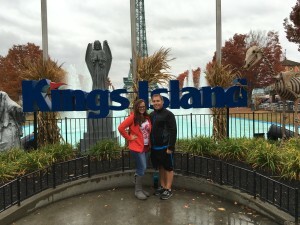 At Kings Island you get to do just that. You exit the park out onto backstage access roads, that literally take you to the footers of the roller coasters. Just as the first part of the loop is flat, this section is very hilly and challenging. 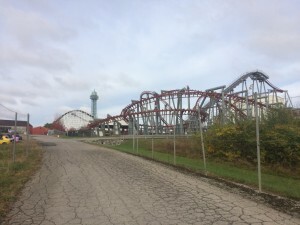 It also gives you a front row seat for just how expertly-designed Kings Island is, as the roller coasters utilize the terrain to deliver great rides. You will run along the base of those rides, and at many times, under the coasters themselves, getting vantage points that most people will never see. If you are up for a challenge, this course is for you. There are some steep hills and drops on this backstage section. If you are running for time, be careful not to over-do it here as you may have to slow your pace to ensure sufficient footing. Be safe and have fun with it. If this is a goal race for you, be sure to work in some short, steep hill climbs and descents so you are ready on race day. Dinosaurs: Kings Island has a special ticketed area where visitors can view animatronic dinosaurs. Runners get to run THROUGH this area, twice! It is certainly a unique feature of this course, and one that offers entertaining distractions, especially when you see the dinosaurs dressed in halloween costumes and try to grab glimpses of the signs as you run past. Hydrate! Hydrate! Hydrate! One of the reasons you pay big bucks for races is on-course support. If a race does not offer decent on-course support, you might as well save your money and do a training run on your own. So when races deliver on the support, runners should know about it so they can seek these races out. I already pointed out 3 hydration stations, each of which pull double duty, meaning that each roughly 6.5 mile loop has 6 hydration stations. Since it is a double loop course, this means 12 hydration stops. But wait, there’s more! As just before you head out for the second loop, there is yet another hydration stop. That’s right, 13 water stops in 13.1 miles! Safety is always a top concern for Casual Runners on race day, and races that average a water stop every mile show that they share this concern. Train, water park, and sprint to the finish: You will be treated to some of Kings Island’s wooden roller coasters and the steam railroad tracks as you make your way towards the end of the loop, which leads you into a backstage entrance to Soak City Water Park. The water park is closed for the season, so it is almost eerie (but in an entertaining way) to run amongst the closed lazy river, slides, and other water attractions. The front part of the water park is set up for Halloween events at this time of year, so be sure to check some of those displays out, because then it is time to exit the park and make a few turns in the parking lot. If this is your first loop, you will be directed back out to do it again (again, maximizing all of the fun sites and experiences I just listed!). If you already ran your two loops, you will make a left turn and there is one last, short sprint to the finish! As you can tell from all of our Run and Ride articles this year, we are definitely excited about the SMOs. Each event had its own SMO in the shape of a roller coaster car ridden by a member of the Peanuts gang! To make it even better, they all connect together with magnets to make a roller coaster train! Our apologies to our friends at Run and Ride, you set the SMO bar so high this year, how ever are you going to top it in 2017???? Why yes, yes I am happy. Thank you, and yes, chocolate milk is the post-race bomb! Run and Ride put on another fun race event with great SMOs, and amazing swag! The fact that part of this course are challenging should not scare anyone away, as it is good to challenge yourself in your Casual Runner adventure, and there are plenty of flat, fast sections to offset the hills. Additionally, utilizing a double loop course maximizes the amount of time you get to spend enjoying all of the course’s great features. So, yeah, I would absolutely run this race again.